Let's face it � most of us don't know what we want in life. Let's face it � most of us don't know what we want in life. This holds true especially with respect to career options. Often, rash decisions end up being the ones we regret the most in the distant future. 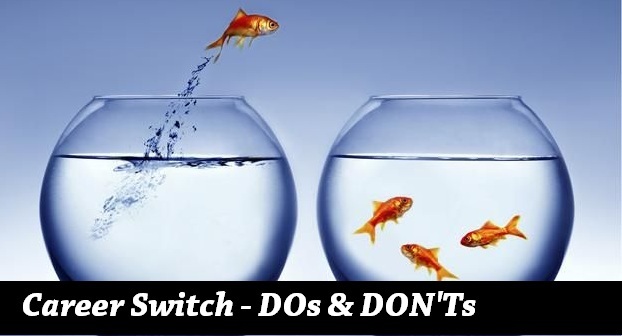 Here are some things to consider before you jump ship to unknown waters. Before calling it sour grapes, one should always think and re-think their decision to consider a career switch. Evaluating one's decision is an excellent way to delineate the motivations. Are you planning to quit your job on the grounds of discord with your colleagues or for the lack of job satisfaction? Is quitting your job the right approach? If you feel that your issues can be resolved with some counselling, then you can put your decisions to quit on hold. Often people choose a career field in desperation and fester in their poor choice. However, if one has a clear-cut reason for switching careers, they should definitely abide by it. Having decided to leave your present job behind, you need to evaluate the skills you'd need for the new career in question. Different organizations have requirements for candidates with differing skill sets. You should also consider the fact that success in one career does not guarantee triumph in another. Having identified the skills needed, you should make it a point to hone and sharpen them as best as you can. If you're really passionate about the career you wish to choose, you should gather all the prerequisites needed for eligibility. When it comes to stepping into uncharted waters, one should test it in every way possible. Gather as much information on the new career option as possible. Research using the Internet or ask bona fide professionals to aid your quest. You need to address the issues of your salary, job security, job profile, the promised incentive and the demanding nature of the job. These questions are extremely crucial in determining whether the intended career choice is lucrative enough or not. Sometimes ideation falls flat on its face when implemented in the real world. When it comes to considering something as potentially drastic as a career change, you should try and get a real feel of the intended profile to see if it suits you. Hands-on experience is a relative game-changer that can help determine the compatibility of a given job profile with the aspiring candidate. Professional networking is a crucial step in helping you get the ideal job. Contact people who are working in the field that you're interested in. They will be able to point you in the right direction in terms of references, vacancies and requirements. Using the Internet to access available job profiles through job search portals and consultancies is also a good idea. A shift in one's career is an irreversible decision and should be made with utmost care and consideration. By following the suggested tips, you will be able to tide over all the potential risks and embark on a smooth career path.